Comments on "On the Street...Horizontal Stripes for Spring"
What do you think about horizontal striped shirts? Do you think people can pull it off? The young man in the middle is half-covered up. He needs his own photo--the glasses and shorts are amazing! The middle pic is very Harry-Potterish. love the glasses in the middle pic. & the top is just too funny - talk about out-there personality! Runway Rules 8:43 - Anything ca n work if done right... i have believed that since grade 8 in English class when the teacher asked the class do you think this story would have worked from this persons point of view. Lots of people said no but i said why not. I have stuck with that mentality since then and it has served me well! P.S. I kill in horizontal stripes! Common denominator to the three people in the pics? They are all on the slim slide. Yes, our retailers have wonderful stuff with horizontal stripes, but if one is packing some extra poundage (as yours truly), please abstain!!! Love the yellow boots, btw! Renata wins again in photo 3! The first guy with the thick-frame glasses kind of weirds me out. The third photo looks like Renata. Is that her? Pic looks like it was taken a bit earlier in the year. Very clever how she's put that striped shirt under a v-neck wool sweater -- and then the boots! I LOVE THE FIRST PICTURE!!! THAT guy is my hero! Try asking if that guy cares what you think! I don't normally leave negative comments, but honestly this is like the best advert AGAINST horizontal stripes for spring! #1 is a little too scary for my liking, #2 too Harry Potter-like and #3's yellow boots are a little alarming to say the least.. Apologies for the non-sartorial rabbit trail, but does the photo of gentleman #1 remind anyone else of Bob from Twin Peaks, in one of television's all-time scariest scenes? That's why I find it a bit unsettling. That's the Italian lady you featured recently, on her way to ...fishing shrimps! Joke aside, the best stiped t-shirts are the authentic French sailor ones, from Brittany. Look for Saint-James (one of the good brands). My husband, who si American, bought one at a boat show and he pulls it off very nicely. I don´t get the idea of stripes. Something in my subconscious mind screams " back province!" I think, stripes belong to children´s wear, pyjamas or to the Bretagne. Not sure this is a very urban look at all! I am not sure about such broad and, in the third picture, colorful stripes. The first shot is incredible and his pants make me smile. They do look like pajamas though. As for the middle chap, I echo the same sentiments as other commenter's--he needed his own full shot. His shorts are very interesting and his frames are beautiful. I can see the Harry Potter likeness. I definitely think horizontal stripes are workable. 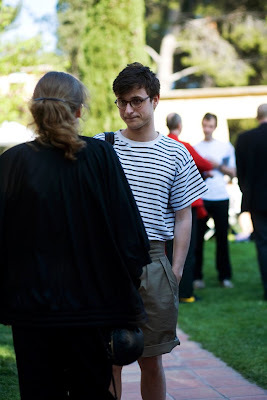 I just captured a young chap in St. Louis on my street style blog donning a horizontal striped shirt similar to the chap in the second picture so the trend is well recognized! I agree that this is potentially a warning against wearing stripes. i'm not inspired by any of these combos. There are some great products out there, is this really the best of the best? the sartorialist did not invent the horizontal striped shirt. get over it. Contrary to what many of you are saying, I happen to love the first photo. Love the brightness of the pink coupled with the striped pants. A standout. I want to grow up to be the guy in the first photo. He always rocks! It's not exciting anymore. Kind of cliche actually. Hmm- did people stop wearing stripes? First photo: Beetlejuice! Love it. Not everyone can pull that off. Horizontal stripes for me are just boring unless they are broken up in an interesting or witty way. Horizontal striped leggings on a grown man even if he is wearing a cool pink shirt should be outlawed. The first pic is HILARIOUS!!! I love horizontal stripes. They can be chic and whimsical--sometimes both simultaneously, but I do agree with the earlier comment that they look best on thin people. 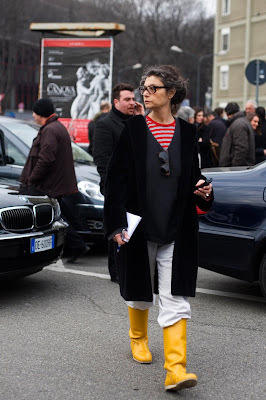 Love yellow boots' nonchalance and covet her huge ring. Another time RENATA! She is fantastic! I love the italian woman in the third pic, of course. come on. the lady with the yellow boot looks exactly like the late Anne Bancroft, which is to say wonderful. the the shorts on the boy in the second one. I wish I could see all of them! Hell, I'm a girl and I want a pair! does anyone know who made the shorts #2 is wearing? AMAZING. I am allll about horizontal stripes right now. Especially thin black and white. Great paired with florals. I can only pray to look as elegant and beautiful as the lady in the third picture when I am older. This is absolutely my favorite shot of anyone. I wish I knew that first guy in the striped pants. He looks like a riot! Oohh gosh, the first pic´ture with the striped man.. I kind of love it but I hate it at the same time..
Could Renata be any more chic?!?!?! "Take" pic 1, is his name pronounced in the japanese way , is a very very interesting nice intelligent generous person. always on the brink for newness and new talent..an open and very fresh mind. love yah , Take ! the person in the second picture looks exactly like one of the guitarists/back-up singers from Bishop Allen! i've seen horizontal stripes a lot of times seems life people loved it....nothing new! I love strips but don't like the first pick at all. I am more of a striped shirts or jumper person!